The businesses who enjoy the most success online are those who make the effort to apply regular, iterative changes to their websites with the goal of achieving incremental improvement. This applies equally to websites that sell and those whose primary purpose is to generate leads – eCommerce websites and business websites. Iterative changes are those implemented through a structured cycle of planning, development, measurement and evaluation. At the core of the measurement and evaluation phases is the data provided by analytics tools such as Google Analytics. In this post I’ll introduce you to a significant addition to the Google Analytics toolbox – Enhanced eCommerce Tracking and Reporting, a tool specifically for eCommerce operators who are looking for greater insight into their shoppers’ behaviour. Enhanced eCommerce Analytics is an add on, or enhancement as the name states, to the “standard” eCommerce tracking and reporting offered by Google Analytics. By implementing some changes to the analytics code on your website and analytics account settings, Google is enabled to collect more data – better data, which will enable you to get unprecedented insights on your customers’ behaviour on your eCommerce store. In most basic terms, the enhancement allows you to see how your visitors move through your transaction funnel, from list view to product page view, add to cart and ultimately checkout and transaction. Transaction, that’d be a sale, a conversion, we all love those, right? The question is, what’s more valuable than knowing how your customers convert? Answer – knowing how they don’t convert, where they drop out or abandon. Enhanced eCommerce Analytics provides this data – specifically where along the transaction funnel your potential customers drop off. This information can be analysed and evaluated in order to make targeted changes aimed at reducing drop off, or to put a positive spin on it, increase success from one step in the funnel to the next. 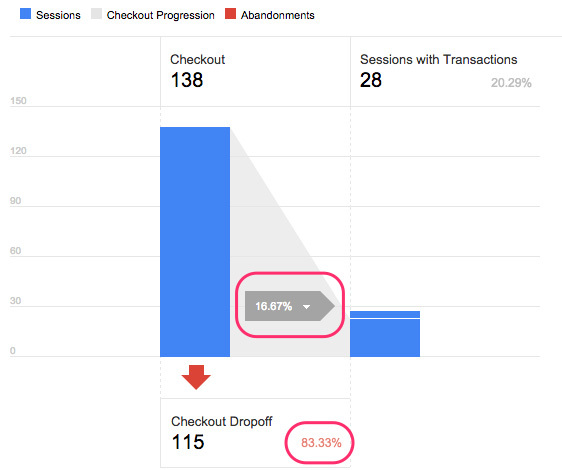 Analyse how far shoppers get in the shopping funnel and where they drop off. Understand which products are viewed most, which are frequently abandoned in cart and which ones convert well. Upload rich product metadata to slice and dice your data. Create rich user segments to delve deeper into your users’ shopping behavior and the products they interact with. Here’s a quick non technical rundown of the requirements. Firstly, we’ll assume that you’ve got Google Analytics up and running on your site. Following that you’ll need to ensure that you have upgraded to the (not so) new Universal Analytics. If you satisfy those two requirements, some settings then need to be updated from within your Analytics account, and finally additional snippets of code are added to a number of website core/theme files. This article isn’t intended to be a technical “how to” guide to implement Enhanced Analytics, the information I’m presenting here is background info only. If you are looking to do your own implementation, start at the Google Developer page here. Once your site meets the above requirements, you can expect the new data to start flowing in. Let’s take a look at what you’ll be able to see within your Analytics reports. From within your Google Analytics admin area, you will see a new menu item “Shopping Analysis” under Conversions > Ecommerce. This is where you’ll find the additional data collected by the Enhanced eCommerce tracking, under the sub items “Shopping Behaviour” and “Checkout Behaviour”. Note that Enhanced Analytics also supports refund tracking! As you can see in the above screenshot, the vertical bars provide a good visual of the drop off from one step to the next. The data tells us the number of sessions, success rate per step and abandonment rate per step. Looking at the drop off rates alone, you can quickly identify holes in your funnel and start thinking about remedial actions to test. You can also quickly crunch a few numbers to see what impact various hypothetical increases in conversion rates, at various steps, might have on your bottom line. This is where you can put your checkout process under the microscope. Each individual step/page in the checkout process can be tracked. Note! The transaction funnel in this case has only 1 step for the checkout process as this particular Magento site is running one step checkout. If you had multiple steps/pages in your checkout, you could add code to each of those steps to get tracking across the entire checkout process. Neat right? You are also able to create advanced segments at each drop off point. For example, you could create an audience called “No Cart Additions”, which would be comprised of the 4182 sessions that had product views but did not add to cart. With that segment, you can then perform marketing activities such as Google Adwords retargeting. Perhaps advertising with a targeted call to action that prompts customers to make it through the next step, in this case, adding to cart. Following the Shopping Behaviour Analysis and the Checkout Behaviour reporting come the traditional eCommerce reporting features of Google Analytics; Product Performance and Sales Performance. Under Product Performance you’ll find additional data – “Cart-to-Detail Rate” (how often were a product’s details viewed and then added to the cart) and Buy-to-Detail Rate (how often were a product’s detail viewed and then purchased) are the new additions. If you’re not already familiar with these reports, they also contain valuable information and are worth getting acquainted with. A new menu called “Product List Performance” gives details on how various lists are being interacted with. On your Magento site, you can track lists such as New In Store, Featured, Top Sellers etc. and get detailed data that lets you know which lists are performing best. Imagine the improvements you could make to your business’ bottom line if you had access to this level of insight into visitor behaviour – data afforded to you through Enhanced eCommerce Analytics. By understanding where the problems occur in your transaction funnel you can prioritise those pages/steps and start making those small, iterative changes. Then measure, see which changes have a positive effect and which don’t. These “behaviours” are taking place on your site right now, with every click your shoppers make from one page to the next before they (mostly) exit without purchasing. All you need to do is “tell” Google to capture the data and serve it up to you in Analytics. As it stands, implementing the Enhanced Analytics tracking requires you to take action yourself. Given the variety of structures of eCommerce websites and the additional overhead of the code, it’s unlikely that this enhanced tracking will be default functionality of Google Analytics anytime soon. The good news is it can be setup relatively quickly if you are familiar with the process and technically proficient. If not, no problem, you’re already in the right place. If you’re interested in learning more about our implementation services, don’t hesitate to drop us a line.